The text on this website is copyright CUNY 2002-2011 unless specified otherwise. Some images are used here under an education-friendly Creative Commons license, GNU Free Documentation License, or educational fair use doctrine as understood in the USA. The license for a particular image should be mentioned in the comments of the source for the page on which it is visible. If you feel there is an issue with how a piece of content on our site is used, please contact us. This site is powered by the CUNY Academic Commons and WordPress. 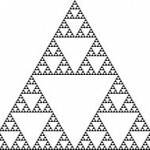 The Sierpinski gasket is a fractal generated by repeatedly removing triangles from the interior of a full triangle.